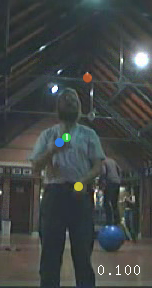 Images for my physics of juggling page. The following picture are the frames of a movie which was shot using a web-cam. The frame rate is 30 pictures/second. 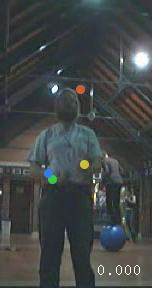 Because of the motion blur, poor light and the compression artefacts the balls on some pictures were hard to spot. I marked the approximate locations of the balls with colorful dots, using cinepaint. 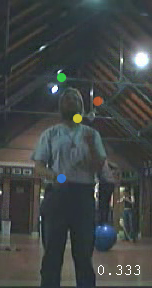 The number in the bottem right corner of the pictures is the time in seconds since start of the sequence.